Egyptian security officials say grieving families in the central province of Assiut have cut off roads and denied the prime minister access to the scene of a train accident that killed at least 50 kindergarteners. A speeding train that crashed into a bus carrying Egyptian children to their kindergarten on Saturday killed 51 and prompted a wave of anger against a government under mounting pressure to rectify the former regime's legacy of neglect. The crash, which killed children between four and six years old and three adults, led to local protests and accusations from outraged Egyptians that President Mohammed Morsi is failing to deliver on the demands of last year's uprising for basic rights, dignity and social justice. The accident left behind a mangled shell of a bus twisted underneath the blood-splattered train outside the city of Assiut, 320 kilometres south of Cairo. Children's body parts, their books, schoolbags and tiny socks were strewn along the tracks. Um Ibrahim, a mother whose three children were on the bus, pulled her hair in grief. "My children! I didn't feed you before you left," she wailed in horror. A witness said the train pushed the bus along the tracks for nearly a kilometre. As one man picked up pieces of shattered limbs he screamed: "Only God can help!" More than a dozen injured children were being treated in two different facilities, many with severed limbs and in critical condition. Several hours after the accident, Morsi appeared on state television, promising an investigation and financial compensation for victims' families. His transport minister and the head of Egypt's railways resigned. "Those responsible for this accident will be held accountable," Morsi said. The response, his critics say, comes too little too late. For months, transport workers have complained about poor management and poor working conditions. Saturday's accident falls exactly one week after two trains collided south of Cairo, killing four people. While many train accidents in Egypt are blamed on an outdated system that relies heavily on switch operators instead of automated signaling, the high death toll and fact that nearly all those killed were young children will likely give ammunition to Morsi's critics who say he has done little to improve life for ordinary Egyptians. Opposition activists have accused Morsi of continuing the mistakes of his predecessor by not overhauling government services. They say he is too focused on foreign policy while moving slowly to tackle a myriad of domestic problems. A day before Saturday's accident in al-Mandara village in Assiut province, the president positioned Egypt as a new Arab champion for the Palestinians. But, with more children killed in Saturday's accident than by Israeli bombs in the Gaza Strip since an escalation in fighting this week, he is already being called on to refocus efforts at home. "The blood of people in Assiut is more important than Gaza," said Sheik Mohammed Hassan, a village elder speaking at the scene of the accident. Evening talk shows and state-radio programs fielded calls from an outraged public that demanded answers as to why Morsi had not visited the region Saturday and instead chose to keep his meetings in Cairo with foreign leaders seeking an end to the Gaza-Israel fighting. Magdi el-Shelh, who lost three nephews in the accident, said his family wants a serious investigation and trial for those responsible. He said he wished for the president to be present to see the bloody scene himself. At the crash site, parents of the missing wailed as they looked for signs of their children on the tracks. An Associated Press reporter at the scene said many of the remains were unrecognizable. Residents of the region, like most other Egyptians in the provinces, are far removed the politics of Cairo and more preoccupied with basic needs. Most are armed and many handle disputes through local tribal councils rather than through official government channels. After the accident, grieving families set up road blocks in the area to prevent Egypt's prime minister from reaching the scene late Saturday. Some burned logs and fired automatic rifles in the air, chanting "Down with Morsi!" Crowds heckled Prime Minister Hesham Kandil when he arrived, surrounded by riot police, at a main hospital treating some of the injured. Around 10 family members of those killed met Kandil on the outskirts of the city of Assiut to ask that a kindergarten be built in their village so that children do not have to travel nearly 24 kilometres to school on unpaved roads. The Muslim Brotherhood, Egypt's most powerful political force and Morsi's base of support, blamed the crash on a culture of negligence fostered by deposed leader Hosni Mubarak. "It is unacceptable that things remain as they are without drastic treatment," it said in a statement, adding that it recommends a renovation of the entire transport system to spare the lives of citizens. Residents also gathered outside the provincial governor's office, demanding the Brotherhood member resign. Egypt's railway system has a poor safety record, mostly blamed on decades of badly maintained equipment during the Mubarak era. Accidents due to negligence regularly killed scores over the three-decade rule of Mubarak, who was accused of valuing loyalty over competence in many appointments of senior officials. Widespread corruption has also been blamed for the underfunding of government services, particularly in poor provinces outside Cairo. Residents near the crash site say the railway crossing guard was asleep Saturday when the bus drove over the track. It appeared the crossing was not closed as the train sped toward it. Authorities detained a railway worker who had fled the scene. 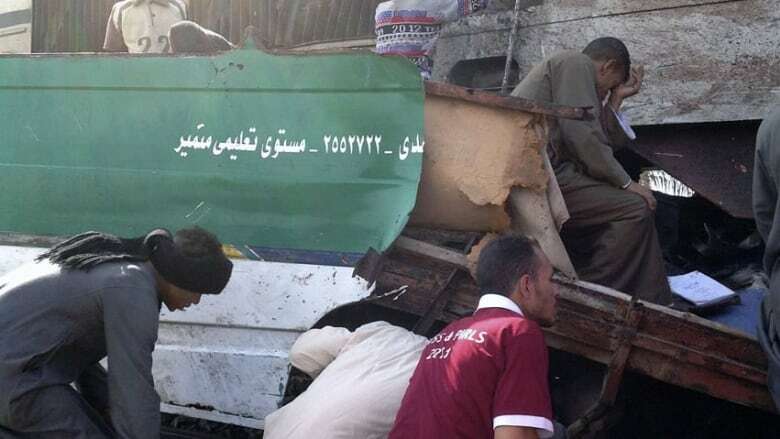 One prominent opposition group said Morsi should bear some responsibility for Saturday's accident. "He is the one who chose this failed government whose disasters increase day after day," the April 6 movement said in a statement.